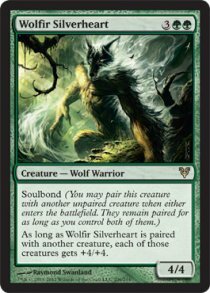 The new soulbond mechanic lets creatures team up to fight side by side. 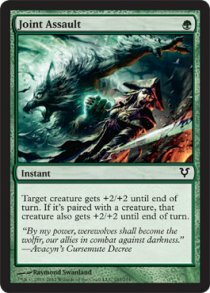 When a creature with soulbond enters the battlefield, you may pair it with another unpaired creature you control. When another creature enters the battlefield under your control, if you control a creature with soulbond that isn't currently paired, you may pair it with the new creature. The two creatures become unpaired if either of them leaves the battlefield, is no longer under your control, or stops being a creature. Abilities—usually abilities on the creature with soulbond—will refer to paired creatures. There are no special rules about paired creatures beyond that. The two creatures still attack separately, block separately, get targeted by spells separately, etc. If Silverblade Paladin and Wingcrafter are paired, they'll both have flying and double strike. There are also a few cards in the set that don't have soulbond that refer to paired creatures. As with any other targeted spell, Joint Assault will be countered if its target isn't legal when it resolves. (Joint Assault only has one target, even though it may affect multiple creatures.) So if you target a paired creature and it leaves the battlefield, gains protection from green, or otherwise becomes an illegal target, neither creature gets the bonus. If it's still a legal target but the creatures are no longer paired (say, because they're no longer controlled by the same player), only the targeted creature gets the bonus. 702.93a. 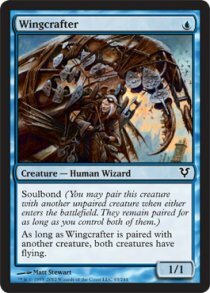 Soulbond is a keyword that represents two triggered abilities. "Soulbond" means "When this creature enters the battlefield, if you control both this creature and another creature and both are unpaired, you may pair this creature with another unpaired creature you control for as long as both remain creatures on the battlefield under your control" and "Whenever another creature enters the battlefield under your control, if you control both that creature and this one and both are unpaired, you may pair that creature with this creature for as long as both remain creatures on the battlefield under your control." 702.93b A creature becomes "paired" with another as the result of a soulbond ability. Abilities may refer to a paired creature, the creature another creature is paired with, or whether a creature is paired. An "unpaired" creature is one that is not paired. 702.93c When the soulbond ability resolves, if either object that would be paired is no longer a creature, no longer on the battlefield, or no longer under the control of the player who controls the soulbond ability, neither object becomes paired. 702.93d A creature can be paired with only one other creature. 702.93e A paired creature becomes unpaired if any of the following occur: another player gains control of it or the creature it's paired with; it or the creature it's paired with stops being a creature; or it or the creature it's paired with leaves the battlefield. Situatie 1: Jij hebt een unpaired Wingcrafter liggen, en je speelt er een Squire naast. Soulbond triggered en je mag ze pairen. Situatie 2: Jij hebt een unpaired Wolfir Silverheart liggen en je speelt een Lightning Mauler. Beide soulbond triggers triggeren, al heeft er maar 1tje effect. (Want nadat de 1e resolved zijn je creatures al paired). Beide creatures zijn pairen en krijgen +4/+4 en Haste, aangezien de 2e abilities niet geven om hoe de creatures paired zijn geraakt. Situatie 3: Jij hebt een paired Druid’s Familiar+Hill Giant liggen en je speelt een Tandem Lookout. Je mag de Tandem Lookout niet pairen omdat je andere creatures al paired zijn, en je mag pairings niet zomaar opbreken.